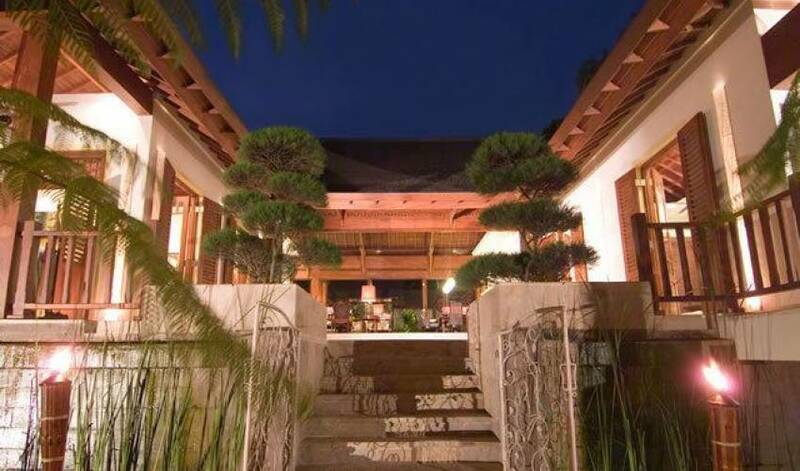 The original colonial design for this villa owes much to the architecture of traditional Javanese plantation houses with the high, wooden-strutted ceilings of the villa’s central hall taking their inspiration from an old college in Bandung, Central Java. The majestic design also incorporates the use of wide eaves and, combined with the elevated position of the land, this allow for beautiful breezes and a flooding of natural light. Comfort and relaxation are the focus of the villa’s plush interiors and furnishings feature oversized sofas, daybeds, poolside loungers and plenty of cushions, so guests will always find a private place for peace and quiet. In addition to the many indoor and outdoor lounge spaces, guests have the choice of three dining areas, all of which present a unique ambiance. 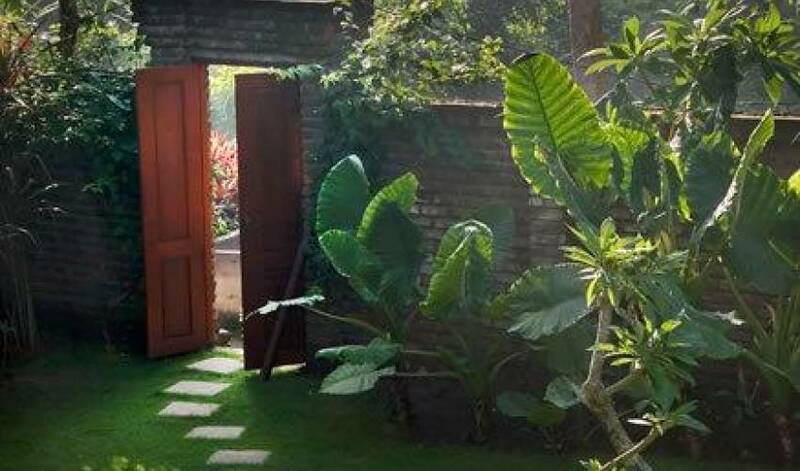 Set well away from Bali’s tourist areas in the tiny village of Tiying Tutul, this peaceful villa sits amid the rhythms of agricultural life and gracefully honours Balinese culture. 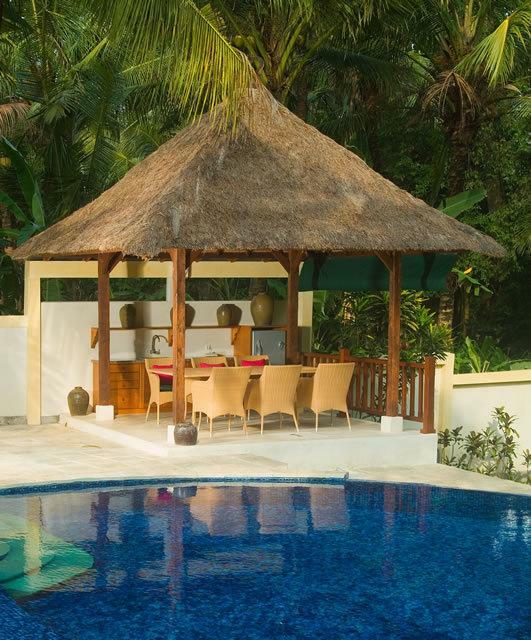 Guests are welcome at Hindu ceremonies in the nearby temple, which provide a unique insight into the religion and customs of Bali, while helpful villa staff – a dedicated team of seven, including manager and chef – will be pleased to offer guidance on temple etiquette. Guests may even be lucky enough to see a barong dance – a sacred ritual staged not for tourists but for the local community to bring good fortune to the village. The villa is approached via a private driveway with a secure car parking area. 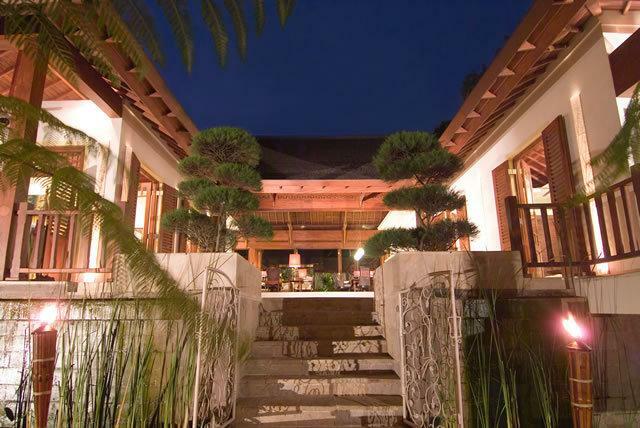 At the villa entrance guests are greeted by a pair of Chinese welcome statues guarding a set of double Balinese doors. The doors open to reveal a covered walkway with a pitched roof, which circumvents an ornamental pond complete with a bubbling water feature. 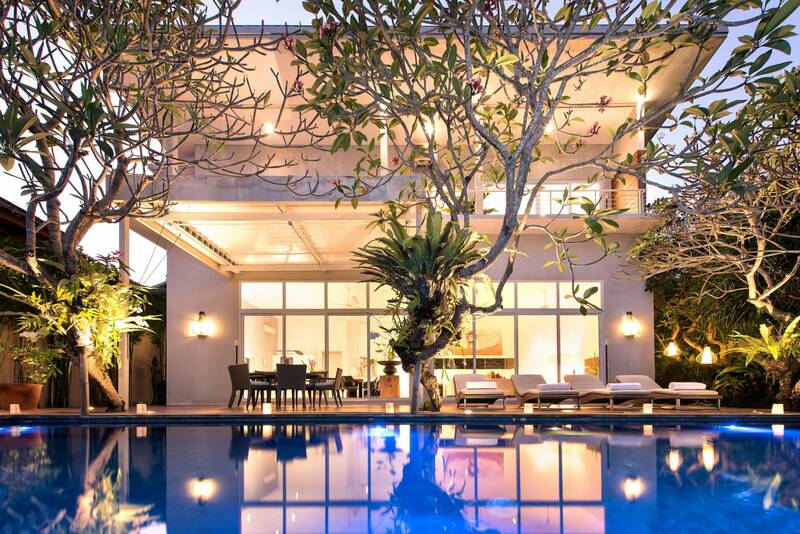 The villa comprises an open-sided fully equipped kitchen and an air-conditioned media room facing each other across the pond while, on the far side, the main building incorporates a living and dining hall and three bedrooms. 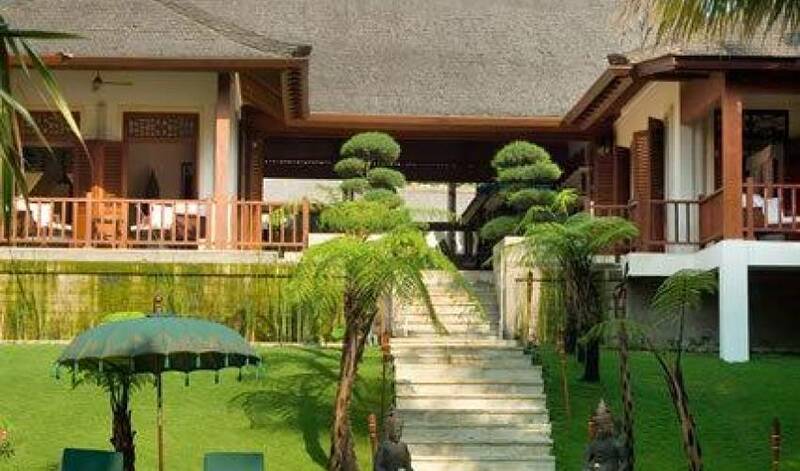 Beyond the main house, a beautifully landscaped tropical garden, complete with its own serene temple, rolls down manicured lawns to a generously sized swimming pool (with shallow feature suitable for children) and a thatch-roofed dining pavilion. 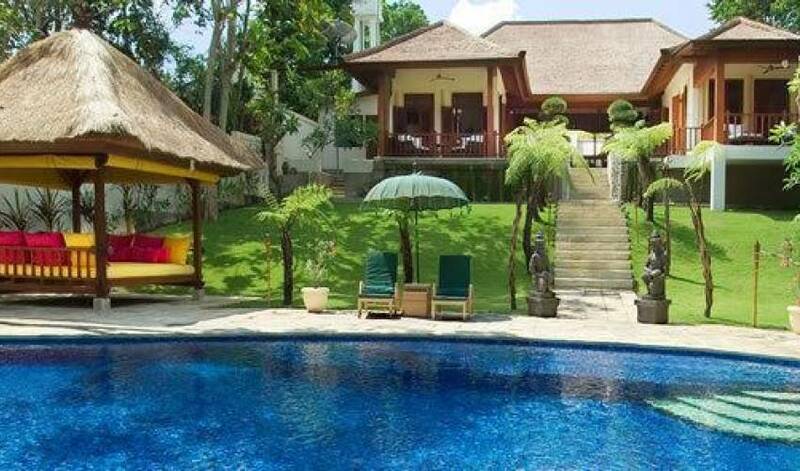 The garden vista flows on to the tropical jungle canopy outside the villa walls and beyond to the surrounding rice terraces creating a picture-perfect backdrop to the serenity of this villa. The villa’s expansive main living and dining pavilionfeatures folding doors at either end that open wide to allow the cool breezes to circulate. The soaring roof in this splendid building is 8.5-metres high and is fitted with paddle ceiling fans. 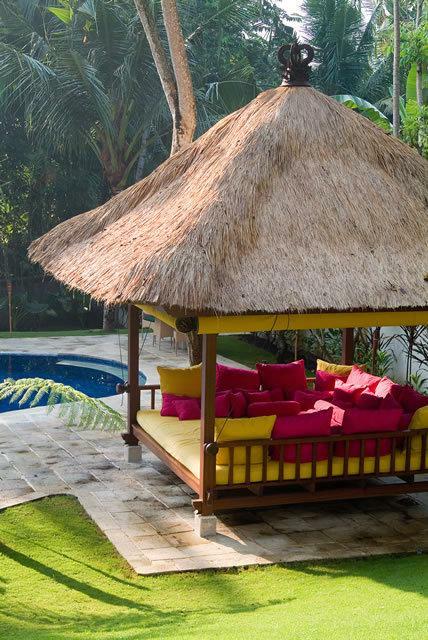 Furnishings include a handsome teak dining table for 10; an attractive display of traditional Indonesian artefacts; wooden lamp-stands fashioned from Javanese statues; armchairs and a huge sofa upholstered in soothing neutral tones. 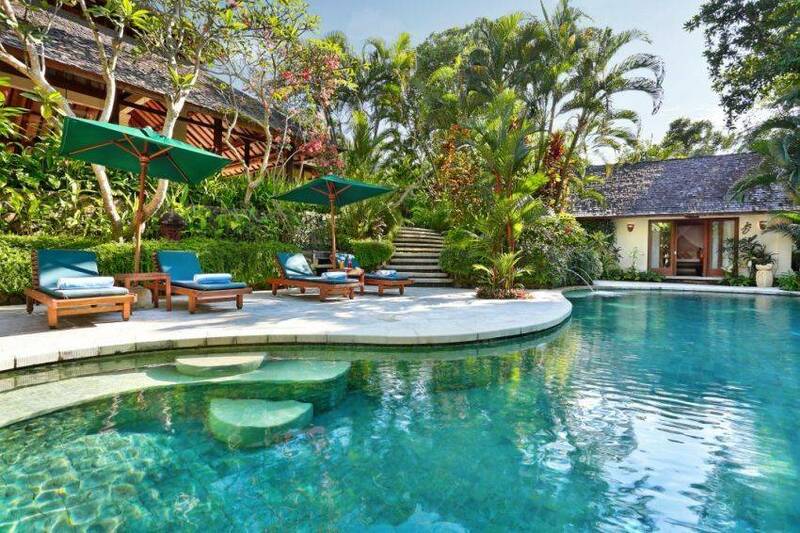 A sunny stone terrace doubles the living space, making this a perfect venue for parties. The open-plan, well-equipped feature kitchen is fitted in glass and cream terrazzo. To one side is a casual breakfast area furnished with a circular marble-topped table and six brightly cushioned chairs. In the villa’s cosy media room stretch out on the big squashy rainbow-striped sofa or kick back on the leather lay-z-boy chair. This timber-clad room has folding doors that open directly onto the pond, appearing to float above it. 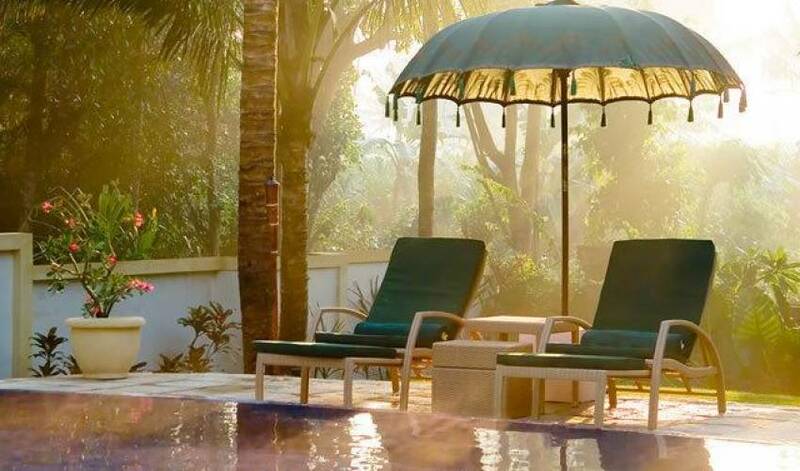 Guests can relax in air-conditioned comfort or open the doors wide and be cooled by ceiling fans and natural breezes. The room is equipped with a TV and DVD/CD player and the high quality sound system is linked via a portable iPod docking station to speakers throughout the villa. A wrought iron gate heralds the stately flight of stone steps leading down to the pool through an avenue of foxtail palms. 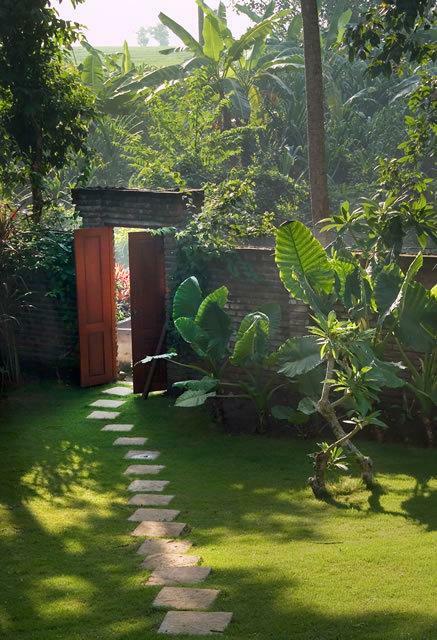 The beautiful garden then rolls down to a river located behind its boundary walls. While the delicately crafted gate is an attractive feature in itself, it separates the main house from the pool creating a safety barrier for young children. The 18-metre mango-shaped swimming pool incorporates a large platform (15cm deep) for kids, and is filled with light salt water rather than chlorine. 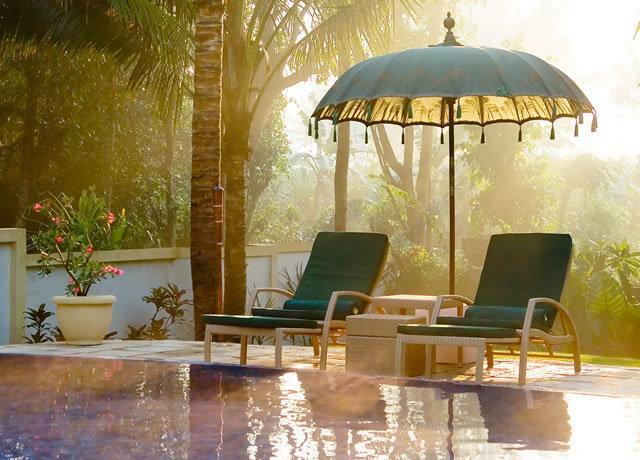 Sun-seekers will relish the cushioned loungers arranged on the pool’s stone terrace, and a relaxation balé, fitted out in colourful comfort, provides a pleasant shady alternative. 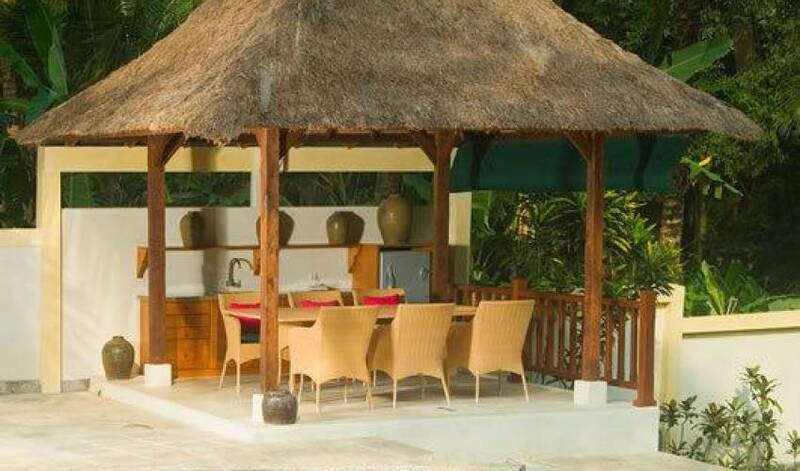 Opposite the balé is a barbecue pavilion with a dining table for six, a fridge, and speakers for the sound system. A convenient washroom is situated just behind. Each of the villa’s three bedrooms presents a different and equally luxurious theme. Each has an ensuite bathroom and is equipped with air conditioning, ceiling fans, a mini-bar/fridge and safe deposit box. The two master bedrooms enjoy soaring roofs and magnificent views together with sunny balconies, furnished with daybeds, overlooking the garden and pool. Fitted with ceiling fans, the balconies are perfect for whiling away the hours with a book or relaxing over morning tea or evening cocktails. The Bali room is furnished with a king-size four-poster bed canopied with ikat(traditional hand-woven textile). The room features polished teak floors and French windows with louvre shutters, which open out onto the terrace and balcony. Timeworn stained glass doors lead into a large dressing room with a massage bed and fitted cupboards with antique louvre doors. Another colonial-style door leads into the terrazzo bathroom, fitted with twin wash basins and a powerful overhead rain shower. A glass skylight in the roof allows the sunlight to stream in above a sunken sculptured terrazzo bathtub. The Colonial room features a polished teak floor, French windows with louvre shutters and a king-size four-poster bed with white drapes and ‘snakeskin’ cushions. In the ensuite bathroom is an oversized sunken sculptured terrazzo bathtub, twin washbasins, a rain shower, a massage bed and ceiling fans. Glass panels in the ceiling give the bathroom an open-air feel and maximise the natural light. The Bamboo room is accessed by double antique doors, and can be set up with two canopied beds for younger guests or as double room. This bedroom’s ensuite cream terrazzo bathroom is fitted with twin washbasins, ceiling fans, and a rain shower. Again, in this room, glass windows in the roof maximise the natural light. Tiying Tutul, the village or ‘banjar’ around Villa Mako, remains primarily agricultural. At the bottom of the garden is a rustic brick wall with a gateway opening onto the riverbank. 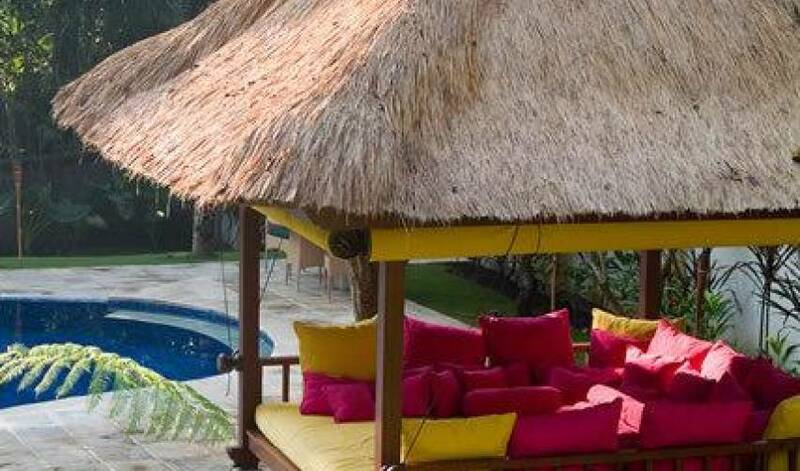 Here, guests will find a simple and private riverside balé, perfect for meditation. This is also the site of a holy spring, where villagers make offerings to the gods. 80 metres further along the river is the village temple. Guests will be welcomed at temple festivals; some may even be lucky enough to witness a barongdance or other Hindu ceremony. The villa staff will be happy to help with ceremonial clothing and advice on etiquette.